The original RFQ line and process layout spelled out five operations to produce the component, which required unique bending to accommodate a structural cross-member. According to the RFQ: The process begins with 2.5-in.-dia. type-409 stainless-steel pipe stock undergoing a bending operation, with the pipe loaded into a bender and bent in four places to create an offset. Starting at one elevation, it then assumes a different elevation to accommodate the cross-member, then is bent back to the original elevation. At this point, benders automatically cut the tube. From there, the tube is pressed to an oval diameter to allow a closer fit to the vehicle underbody. Another step reduces the diameter of one side of the pipe to fit a sister pipe followed by trimming to achieve the final pipe length. The final step: Resize the diameter on the other end of the pipe to fit another sister pipe. Although Coldwater was requested only to provide an offset forming die to provide the oval pipe shape, the company studied the overall process and asked questions. The client confirmed that it was most concerned about maintaining the flow-through volume of the pipe. As long as none of the operations affected the escape rate of the exhaust flow, and the overall volume of the pipe interior remained intact, Coldwater had flexibility in refining the process. This freedom allowed Coldwater to utilize the ends of the tube to simultaneously secure the component and size it. With the redesigned process, the pre-cut tube is manually loaded into a standard 50-ton press and secured on each end by an exterior clamping device. Simultaneously, the press cycles down to form the tube while each tube end is formed to required 2.25- and 2.375-in. dia. Despite the perceived benefits of this approach, convincing the customer to shift to a new process required more than good faith, according to Coldwater officials. 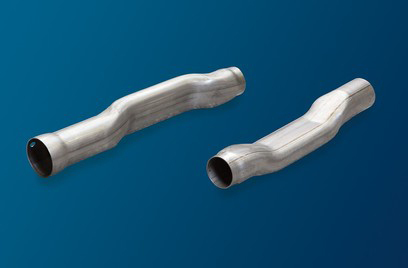 To prove process viability, Coldwater showed the client’s lead engineer a larger tube component from a different application and industry that had been processed in a similar way. Satisfied, the customer awarded Coldwater the job. Beyond meeting original cycle-time targets, Coldwater’s process provided numerous benefits. The customer saved significant tooling costs in transitioning from five operations to one, which also reduced work-in-process time. Secondly, needed floorspace was reduced as all operations integrated into a single off-set operation. Thirdly, quality improved due to reduced handling and setup needs. And, by eliminating the final retrim operation, the new process achieved a 10-percent reduction in material cost. Coldwater has since retooled the original tube-form-and-bend cell for a second part that can be run with only a 5-min. tool-changeover time.